The modern study of cultural evolution, emerged around 1970's, has attracted researchers from various fields and is increasingly widening its scope. Unlike the historical attempts at describing "metamorphoses" of societies under the rubric of evolution, the modern theory sees cultural evolution primarily as temporal changes in cultural variation within a population due to innovation and transmission between individuals. The endeavor to reconstruct cultural evolution in prehistoric societies is by nature interdisciplinary. Archaeology, among all, has the most direct access to records of past cultural evolution, which have been investigated within the analytical framework developed in evolutionary biology. A more recent move is toward behavioral experiments on individual-level learning biases, which are the fundamental drive of population-level cultural phenomena. This symposium emphasizes the interdisciplinary nature of the study and aims at providing the most recent developments in the related fields. Abstract: Cultural variation within a population is subject to changes over time owing to innovation and transmission between individuals. The modern theory of cultural evolution explores these changes by applying the analytical framework developed in evolutionary biology. Archaeological records of prehistoric societies provide the most direct access to past events of cultural evolution and can be described and analyzed in evolutionary terms. A fundamental distinction between two kinds of evolutionary processes should be recognized. On the one hand, evolutionary dynamics are expected to be dominated by random drift when learning takes place in an "unbiased" fashion. If learning is biased, in one way or another, on the other hand, cultural evolution can be cumulative; that is, the utility or complexity of a cultural trait may be constantly improved or heightened over generations. In archaeology, the two processes may be loosely identified with the "stylistic" and "functional" aspects of cultural evolution. In this talk, I will introduce a simple mathematical model for each of the two processes to explain the basic ideas underlying the evolutionary analysis. I will also give some examples of the recent applications of these models. 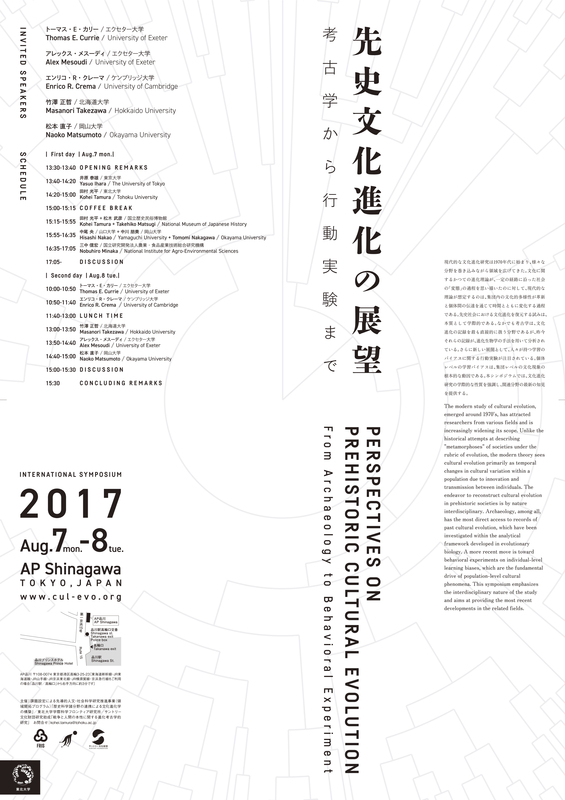 Abstract: The Jomon-Yayoi transition is a transition from hunting-and-gathering to agriculture in the Japanese archipelago, associated with various socio-cultural changes. The Ongagawa style pottery is widely distributed in the western part of the Japanese archipelago and has been considered as a key indicator of the diffusion of the Yayoi cultural complex. Therefore, based on geographical variation in shapes and other attributes of the pottery, previous studies have attempted to reconstruct the diffusion process of the pottery. Although the majority of the studies have mainly used typological approaches, due to the relatively uniform shapes of the pottery, quantitative methods could play a role in capturing morphological similarities in the pottery. In the present study, by using elliptic Fourier analysis, I quantify the geographical patterns of similarities in shapes of the pottery. Based on the results, I further discuss that the framework of cultural evolution can play a role in the inference of cultural transmission processes underlying the geographical variation. Abstract: Kofun or keyhole-shaped mounds are monuments characterizing the Kofun period or the period of the state formation in Japan. They have been a subject of intensive research because similarities in shapes of the mounds have been considered to be a proxy of political connections. As a notable exception in Japanese archaeology, a series of studies on shapes of the keyhole-shaped mounds have used quantitative methods since Ueda’s (1963) pioneer work. However, the majority of the previous studies have several limitations such as being based on a few morphological attributes and over-dependence on typology. The present study analyzed the shapes of keyhole-shaped mounds by using methods in geometric morphometrics, which have been developed to analyze biological shapes in a quantitative manner. Our results quantify and visualize the relationships between the shapes of the mounds, indicating a large amount of morphological diversity of the mounds which have not been fully captured by typological understanding. Abstract: Since Keeley (1996) and others, violence and warfare in the prehistoric era have been intensely discussed: Were violence and warfare common among prehistoric hunter-gatherers? How and why has warfare begun? This talk focuses on violence and warfare in Japanese prehistory and investigates the above questions. First, we show exhaustive data of injured individuals in the Japanese prehistory, i.e., Jomon (13000 cal BC–800 cal BC), Yayoi (800 cal BC–AD 250), and Kofun periods (AD 250–AD 710), which is inconsistent with some previous claims for warfare among prehistoric hunter-gatherers. Second, we show the relationship between the frequency of injured individuals in the northern Kyushu of the Yayoi period and the demography estimated from the number of Kamekan, jar burials used especially in the northern Kyushu in order to investigate the reason of violence and warfare in Japanese prehistory. Finally, some possible future directions of research are discussed. Abstract: Phylogenetic reconstruction in general aims at estimating the most plausible tree or network based on character data of spatiotemporally evolving objects. In evolutionary biology, textual stemmatics, historical linguistics, and cultural evolution researchers have independently and repetitively developed a set of rules for building phylogenetic diagrams from data on organisms, manuscripts, languages, and cultural constructs, respectively. All these sciences have in common the basic features of historiographic sciences. Estimating evolutionary history searches for the best solution among alternative phylogenetic hypotheses. However, the best solution isn't necessarily true in a historical sense because we can't observe directly or experimentally the past evolutionary processes and its consequent patterns. All we can do is to find the best estimate as accurately as we can by comparing all possible trees or networks on the basis of some optimality criterion such as parsimony, or (if possible) likelihood, etc. An iconographical survey of historical development from ancient times to the present of phylogenetic diagrams reveals a wider array of various graphical tools (chain, tree, and network) for visualizing object-diversity and its spatiotemporal modification. These graphical tools could be used for selecting efficient structural models for estimating phylogenies and constructing classifications of evolving objects. All these historiographic sciences share not only basic principles for reconstructing the past but also practical methods of visualizing object-diversity. The historical development of a general theory of systematics is better considered within the context of genealogical visualization and information graphics. Abstract: The increase in the scale and complexity of human societies is one of the most dramatic patterns of human history, and has been a topic of long-standing interest in a number of disciplines. However, broad-scale, systematic, comparative analyses of past societies have fallen in and out of favour. Modern evolutionary approaches to studying cultural change offer a potential way of shedding light on these debates and synthesizing different theoretical perspectives, including understanding how ecological factors have shaped the evolution of human societies. One challenge in assessing these ideas is that information about past human societies has not been systematically organized and, therefore, remains inaccessible for scientifically testing theories about the patterns and processes of societal and cultural change. Here I describe novel approaches to collating, coding, and structuring large quantities of historical and archaeological information. I will demonstrate how we can use these data to test alternative hypotheses about social and cultural evolution using systematic analyses using statistical and computational models. Can we infer patterns of cultural transmission from archaeological data? Abstract: The field of cultural evolutionary studies has developed a rich repertoire of mathematical models of social learning. Early foundational works have laid the foundation of more recent endeavours, and several studies have attempted to infer patterns of cultural transmission from empirically observed frequencies of cultural data, from decorative motifs on potsherds to baby names, musical preferences, and dog breeds. While this wide range of applications provides an opportunity for the development of generalizable analytical work-flows, archaeological data present new questions and challenges that require further methodological and theoretical discussions. What are the inferential implications of relying on the changing frequencies of artefacts rather than ideas? How do we deal with issues of taphonomic bias and time-averaging? Can we safely assume that the recorded frequencies are from a system at its equilibrium? This paper will overview some recent attempts based on a generative inferential framework that could overcome some of these issues. Within this framework, competing hypothesis are formulated as computer simulations and compared against the archaeological record within an approximate Bayesian framework. I will illustrate this approach through a case study from Neolithic Germany, discussing how it tackles some of the most challenging aspects imposed by archaeological data. Abstract: Human culture is exceptional in that it can accumulate and eventually brings knowledge and technology at a higher level a single individual cannot attain in one’s life. Why can only the human beings accumulate culture? What mechanisms underlie the successful accumulation of technologies and knowledge across the generation? 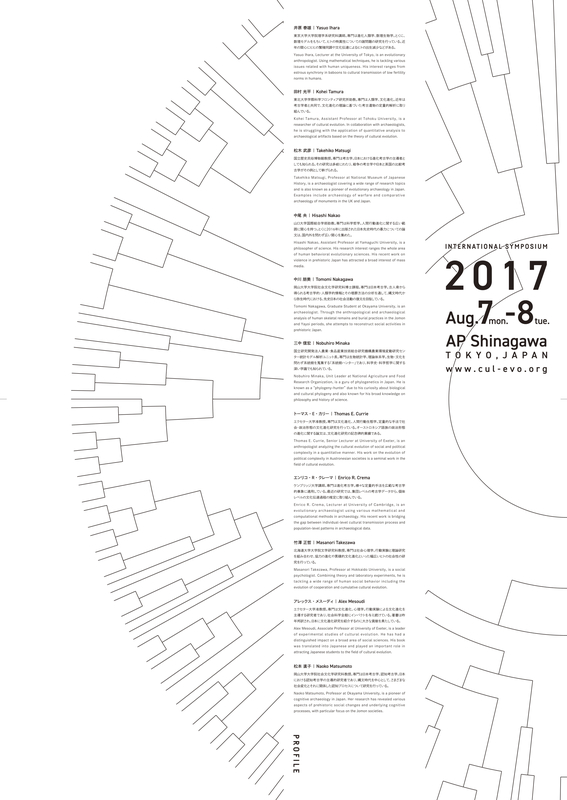 Presenting results of a series of behavioral laboratory experiments and computer simulations, I will discuss the cognitive foundations of cumulative cultural evolution. I argue that a concept of a multimodal fitness landscape help us to understand the problem. In evolutionary biology, processes of evolution are often schematized as a problem of searching a peak in a fitness landscape. In this kind of problem, it is often the case that the system gets stuck at local maxima and further evolution is prevented. For the culture to cumulatively evolve, it needs to escape from being stuck at local maxima. Our studies demonstrate several ways how human cognitive mechanisms solve the problem and promotes the cumulative cultural evolution. Abstract: An often-overlooked means of validating cultural evolutionary models of historical processes is by testing them against modern-day human behaviour, using lab experiments. Experimental simulations have many limitations, but used in conjunction with historical/archaeological data and formal models, they can provide useful checks on assumptions and information on the plausibility of particular behaviours. Here I present three case studies. In the first (Kempe, Lycett & Mesoudi, 2012), we experimentally tested the ‘accumulated copy error’ model of artifact transmission, where minor imperceptible differences in artifact size introduced during copying cause different artifact lineages to diverge over time in a predictable fashion. In the second (Mesoudi & O’Brien 2008), we simulated the cultural evolution of prehistoric North American arrowhead designs, showing that real-life patterns of cultural diversity can be recreated in the lab where, unlike in the archaeological record, learning behaviour can be observed and manipulated. The third case study concerns a recent challenge to a popular hypothesis that group size partially determines cultural complexity in the archaeological record. I review several previous lab experiments to show that this challenge is unfounded in several respects.